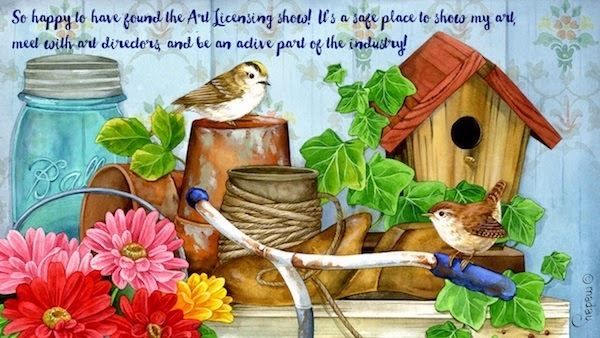 Art Licensing Editorial: Do you need to be a brand to successfully license art? Note: The following is an editorial and are my opinions so not everyone will agree with them. But, I do welcome all comments (positive and negative) to give everyone a well rounded perceptive on other opinions. There are many opinions on whether art is a brand or not. And, an often-asked question is if an artist's work needs to be a brand to be successful in the licensing industry. The short answer to these questions is that art can be a brand under certain conditions but art does NOT have to be a brand for an artist to be successful in licensing their work. Read the following to find out why I believe this. According to Wikipedia, "A brand is a name, term, design or other feature that distinguishes one seller's product from those of others". Brands in today’s market are associated with product trademarks (Coke Cola, Harley, Kenmore, Rice Crispy, Vera Bradley), sports, entertainment (Disney, Sesame Street), well-known personalities (HGTV "stars", Donnie Osmond), some artists, and many others. Theoretically any creation of an artist is a brand because every artist incorporates into their art their own style, color combinations, and composition. But, unless the art is VERY different from other art, it is not usually licensed "as a brand". Art directors and others in the art licensing industry are very familiar with artists work and can easily distinguish whose work it is. However, most consumers cannot recognize small differences between different artists art. Thus, art must be very distinct and unique for it to be considered a brand in the art licensing industry. Licensing an art brand is valuable to manufacturers because brands tend to sell more products. Consumers purchase not just one product but continue to purchase products of a brand they desire. Manufacturers such as Demdaco and Enesco license many brands and produce a huge variety of products specifically tailored for each brand. Sculpture artist Susan Lordi (Willow Tree® brand), artist Kelly Rae Roberts, and artist Kathy Weller (Yoga Pals brand) work is licensed to Demdaco as a brand. And, carver Jim Shore, and artist Suzy Toronto work is licensed to Enesco as a brand. All of these artists are very successful since their art are very much sought after by consumers. Look at the art of the artists mentioned above and notice how unique they are. Also read, "What Makes the Willow Tree® Brand Such a Success?" Not all manufacturer business-model depend upon licensing art brands. Most manufactures license work based upon the style and theme of the art and not necessarily art by a recognizable brand. Although some manufacturers license both art brands and none art brands. 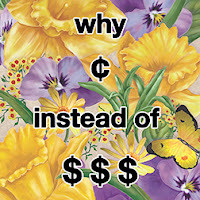 Artists Paul Brent, Hautman Brothers, Susan Winget, and many others earn good money by licensing their art but not as a brand. Not every person will agree that the artists mentioned above do not have art brands because all three of them do have a consumer following. And, some manufacturers do license collections of their work and showcase them in their catalogs with their name, picture, and biography. However, each of these artists art style is somewhat similar to other artist's art style so consumers may not recognize who created the art until they look at the artists name on the product. That is why they are not considered a brand according to the definition stated in Wikipedia. 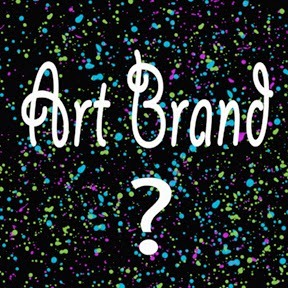 But, does it matter the above artist's work is considered a brand or not? NO! It does not because they are very successful in licensing their work. And, the reason why is because these artists have acquired a relationship with many manufacturer art directors and the credibility that they know what art consumers want on products. Thus, they continue to get many licensing contracts. But, it has taken them years of hard work, research, and trial-and-error to become established, and their work sought-after. 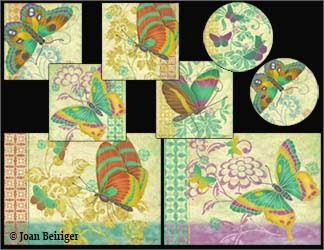 To learn about Susan Winget and her licensing success, read "An Art Licensing Winning Team: Susan Winget Art Studio." 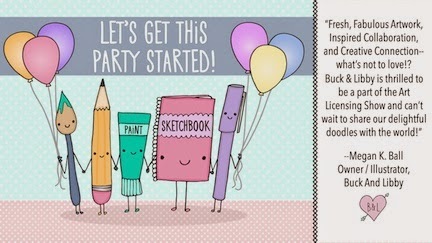 An artist does not have to have an art brand to be successful in licensing her/his art. What it takes is hard work, learning what kind of art and themes consumers want on products, being prolific in creating art, creating relationships and submitting lots of art to manufacturers for licensing consideration, being willing to compromise, being realistic that it takes a long time to get revenue, and do NOT give up! 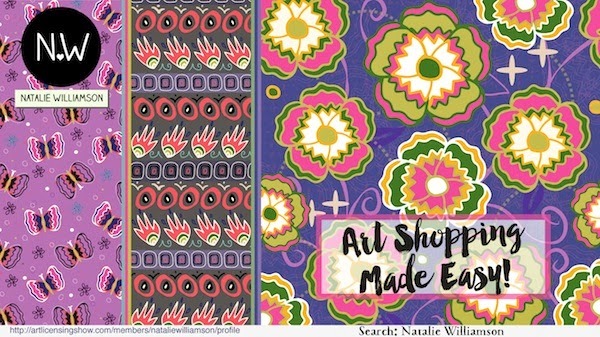 Art Licensing: When do you Submit Art to Manufacturers? As often heard in the art licensing industry "it depends" is the inexplicable answer to the question "When do you submit art to manufacturers for licensing consideration?" Each manufacturer has a different deadline depending on its business model, product line, production cycle, and clients. So, the only way to find out the deadlines for submitting art is to either see the information on the manufacturers website or ask by e-mail or phone call. Some manufacturers accept all art theme submissions year round and either license art immediately or files it for future consideration. Some have big box store clients and these manufacturers are constantly giving presentations to them. Hence, they request art for the presentations to be put on hold but do not license it unless their clients want the art put on the products. 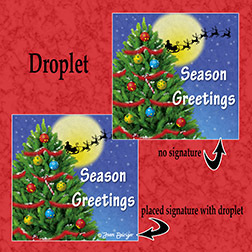 Other manufacturers have specific deadlines that they post on their websites such as greeting card manufacturer Leanin' Tree and will license the art they choose for the following year product line(s). Some manufacturers send art requests several times a year to the artists and agents on their call-out list. However, the majority of manufacturers need to be contacted via email or by telephone to find out their deadlines. Hint: When you contact manufacturers, ask if they have an art call-out list and request to be added to it. If you cannot find out the manufacturer art submission deadlines (often happens) then you need to make an educated guess. 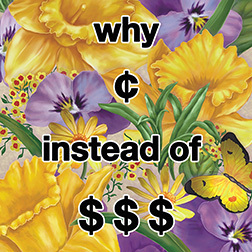 Most manufacturers are looking for specific art themes at least two times a year. 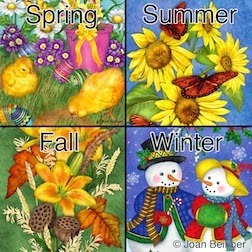 Those are for Spring/Summer (approximately March through August) and Fall/Winter (approximately September through February) that includes all holidays and special occasions during those periods. Many manufacturers decide on what art to license 12 to 14 months before it is introduced to retail. For example, art deadlines for the fall/winter 2016 season could be as early as July 2015. The key to licensing your art is to create the right art for products that appeals to manufacturers, retail stores, and ultimately consumers. Finding manufacturers that license art requires research, research, and more research. You need to find manufacturers that are a match with your art style, find out what art themes they want, how they want art submitted and in what format. 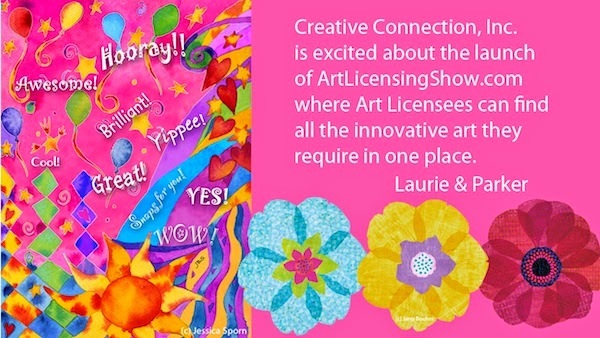 Find out more about licensing art by reading "How to license art to manufacturers". Why does it take so long to see licensed art on products and get revenue? It "can" take 18 months or more before an artist gets any money after a deal is signed unless the artist is lucky to get an advance toward royalties. The reason is because of the many steps involved during the entire process (contract negotiations, art revisions, manufacturing of product, placement on retail shelves) before receiving the first quarterly royalty check. How long it takes depends upon the industry but paper products made in the U.S. usually takes a shorter time than ceramic products that need the creation of molds and are manufactured and shipped from China. Read "Licensed Art - Getting Paid Takes a Long Time" to see an example of a time-line and steps required from submitting art to receiving royalties. Note: Not all licensing deals or getting revenue take a long time. Each manufacturer is different and some deals can generate revenue within a few months after signing the contract especially if it was a licensing flat fee. More information about different kind of licensing contracts can be read on "Licensing Art - There is no such thing as a typical deal". 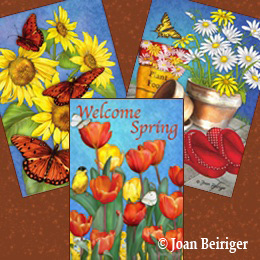 Art Licensing Editorial: What Makes the Willow Tree® Brand Such a Success? When fine artist Susan Lordi received her Masters in Fine Arts in Textile Design in 1993, I am sure she had no idea that she would not only become known for her fine art textile designs but also for her sculptured figurines created for the gift market. 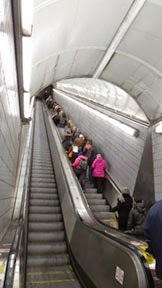 The transition from creating fine art that appeals to individuals to creating art for the mass market is no easy task. But, Susan did it right because her Willow Tree brand has been a huge success for the last 15 years. Consumers worldwide purchase Susan’s figurines and her other products produced by DEMDACO. Studying how artists become successful is really informative and one of my favorite things to do. 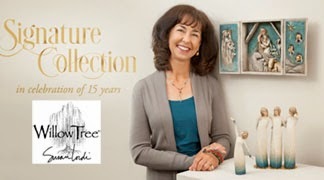 I have followed Susan Lordi's success for years and have always admired the simple carved wooden look of her Willow Tree brand figurines and her ability to show emotion without facial expressions. Art brands tend to sell more products than non-brands because the customer base grows as the brand becomes more popular. To become a brand that is recognized by consumers the art must be unique and different from other art. And, to become successful and stay successful the brand must resonate some emotional response with the consumer, appeal to a wide spectrum of consumers, grow slowly, and stay true to the look of the brand but continue to be refreshed. I think Susan Lordi has encompassed all these requirements in her Willow Tree brand. The following is why I think so. When Susan decided to create for the mass market in the late 1990s, she did her homework and noticed that there was a void in the gift industry of simple figurative sculptures that depicted relationships with others and the world around them. By creating a sculptured style of less-is-more and capturing a moment in time between persons and nature in her carvings, Susan created a style that is truly unique and recognized by consumers. View "Susan Lordi Marker, Central High 1972" video of Susan describing her art background and the creation of her Willow Tree brand. And, also view "Susan Lordi - "Willow Tree" video to see a major influence in Susan's carvings. Note: These videos show Susan's passion in creating her work, which is truly inspirational! To sell any product, it has long been known that the product has to somehow resonate an emotion with the consumer so that she/he feels the need to purchase it. Susan Lordi creates figurative sculptures that depict sentiments anyone can relate to. And, because no expressions are shown on their faces it allows each person to interpret the meaning of each figure in their own way and makes it more personal. Thus, her sculptures appeal to a large number of consumers. Unlike successful art based on trends that evidentially fade away, Susan’s sculptures are timeless and are continually sought by consumers. No wonder the Willow Tree brand is so successful. View "Willow Tree Family Groupings" video to hear Susan's reasoning on why she creates her carvings the way she does. Consumers are always looking for new and different looks when purchasing products. Thus, artists need to regularly keep their art fresh and new looking when submitting to manufacturers for licensing consideration. Susan Lordi has met the challenge of evolving and keeping her carvings fresh over the years while keeping her own aesthetics so that they are still recognizable as belonging to the Willow Tree brand. Although she has kept soft washed colors that are a trademark of the brand, over the years she has refreshed her sculptures by adding some embellishment to her work with deeper colors, and/or metal accents. 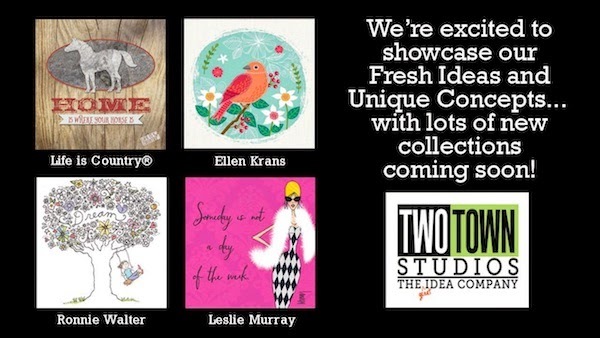 Note: Susan really out did herself with the introduction of her elegant Signature Collection at the January 2015 Atlanta Gift Market. 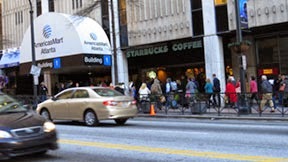 When I walked by the DEMDACO showroom in Atlanta, I couldn't stop looking at the collection. A gradation of deep turquoise blue at the bottom of the figures with a scattering of gold-leaf raised dots makes them absolutely stunning. And, gold accents on a turquoise blue background on her triplex shadow boxes of Starry Night Nativity made them really beautiful and totally unique. Brands will not have staying power in the gift market if they swamp the market at once with all kinds of products. This is what happens when manufacturers hop on a perceived new trend like last year's chalkboard style art seen at the Atlanta Gift show. This year there were nowhere as many showrooms using chalkboard art on their products and probably that style will soon disappear. It is better to slowly introduce new products so that the market is not inundated with them and consumers will look forward to seeing what is new each year. The Willow Tree brand follows that business practice and has slowly added new products over the 15 years since it was introduced at the January 2000 Atlanta Gift show. There is much to learn from sculpturer Susan Lordi even if you as an artist do not have an art style that is unique enough that consumers recognize as yours or even if you have several art styles. Susan’s success has shown the importance in learning what attracts consumers to art, to create from your heart so it resonates with consumers, and to continually refresh art so that the product is salable. And, most importantly you need to continue to learn everything you can about the art licensing industry and all industries associated with it. Education is power that will help you in creating licensable work and obtaining licensing contracts.